Source: CICH graphic created using data adapted from The International Polar Year Nunavut Inuit Child Health Survey, 2007/2008. http://www.inuithealthsurvey.ca/pdf/Child_Inuit_Health_Survey_Aug_31.pdf -accessed August 22, 2017. 1Galloway, T., Kue Young, T., & Egeland, G.M. (2010). Emerging obesity among preschool-aged Canadian Inuit children: Results from the Nunavut Inuit Child Health Survey. International Journal of Circumpolar Health, 69(2), 151-157. 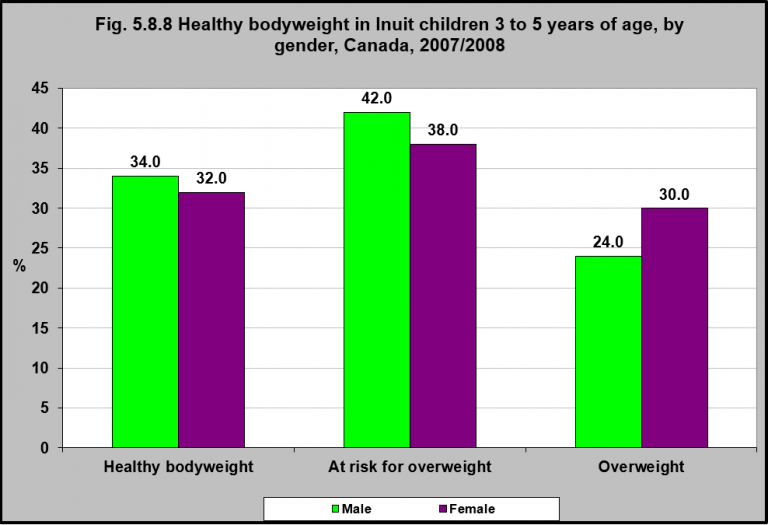 In 2007/2008, 34% of Inuit boys and 32% of Inuit girls aged 3 to 5 years had a healthy bodyweight. Inuit boys were slightly more at risk of being overweight. More Inuit girls (30%) than Inuit boys (24%) were overweight.